Omega-3 fatty acids EPA+DHA are well-researched for their benefits in cognitive function and their promotion of healthy brain aging, as well as the maintenance of general good health. Phosphatidylserine (PS) plays a major role in enhancing and protecting brain function. Lutein and zeaxanthin are carotenoids with strong protective functions within the macular region of the human eye. Vitamin D3 has proven benefits in brain health and neurological function. 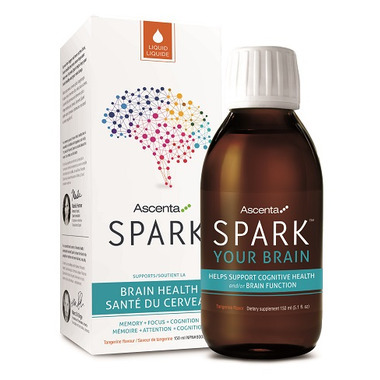 Ascenta Spark is sourced from all-natural, sustainable ingredients. Recommended Dose: Adults take 1 capsule 3 times per day. Use for a minimum of 2 months to see beneficial effects. Non-medicinal ingredients: High oleic sunflower oil (organic), medium chain triglycerides (from palm oil), flavoring, olive oil, tocopherols, canola oil, ascorbyl palmitate, monk fruit extract (siraitia grosvenorii), ascorbic acid. I take it in the morning. It keeps me alert and no afternoon crash. Love this product.